With a handful of options, many travelers are not sure about the best ways to access money in Asia while traveling. Choosing incorrectly could cost a lot of cash lost on bank fees and commissions. As the old investing mantra goes: diversify. Your safest bet for always having local currency on hand in Asia is to have more than one way to get to funds. Although ATMs are usually the best way to get money in Asia, the networks on islands or in remote places can go down for days at a time. Machines often do capture cards; many banks won't mail them to international addresses. For peace of mind, you need backup forms of currency. 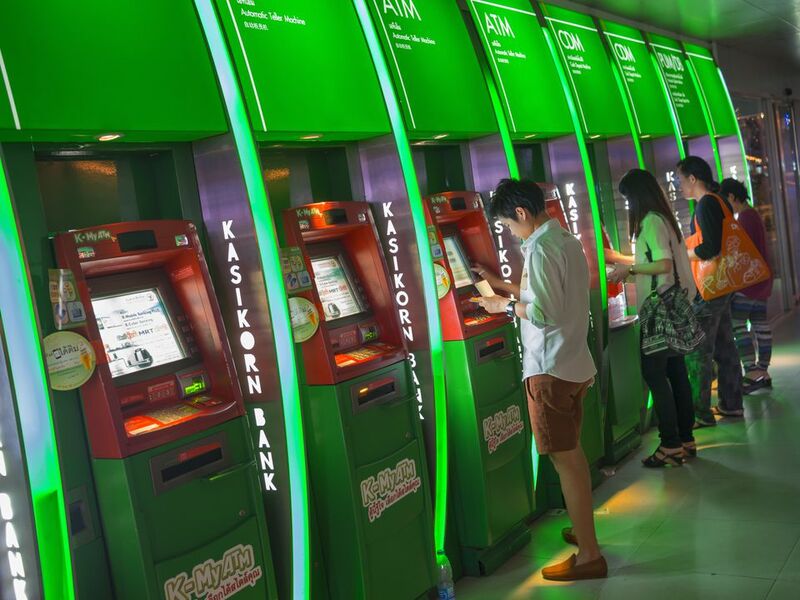 Aside from smaller villages and islands, ATMs connected on all the major Western networks are now available in most tourist places in Asia. Myanmar was one of the last holdouts in Asia, but more and more ATMs can now be found there. Using ATMs to get funds means that you can safely carry less cash, a good measure against potential theft. You can just get money out as needed. The ATMs dispense local currency, eliminating the need to exchange money. Before taking your ATM card to Asia, check with your bank; many charge a small foreign transaction fee (around 3% or less) each time that you take out money. Know about the current scams in Asia before you arrive. Let your bank know that you will be using the card abroad so that they do not flag your account and deactivate the card when charges pop up from Asia! See other things to do before leaving home. The ATM fees in Asia vary widely so always check first; the fee in Thailand is around US $5 per transaction! For this reason, you may want to take the maximum daily limit each time. Tip: ATMs attached to banks often have higher daily limits than standalone ones that take more effort to refill with money. In some places, thieves attach card skimming devices over the real slot on ATMs. The reader steals your card number as your card goes inside of the machine. Pay attention to the card slot, and stick to using ATMs in banks or busy places. When choosing an amount to withdraw, pick a number that will make the machine dispense smaller bills rather than large denomination notes which may be hard to break later. For instance, don't ask for 6,000 baht, ask for 5,900 baht instead. Second to ATMs, many people still exchange money in the airport after they arrive in Asia. While reliable, the exchange rates are usually not favorable. Have an idea of the international exchange rate before you land but don't expect to always get the current rate. Airport kiosks are safe, yet often offer the poorest exchange rates. Once on the street, stick to exchanging money in banks; random street kiosks may or may not be legal. Counterfeiting is common -- never exchange money with an individual on the street. Count your money before walking away from the exchange window. Do not accept torn or faded notes. Many are pawned off on foreigners and may be impossible to spend later. In some countries such as Nepal, you'll need to keep your receipt to exchange money back to your own currency on the way out. This is to ensure that you didn't earn money while in the country. See current exchange rates and more tips for how to exchange money in Asia. Although carrying a credit card on your trip is obviously a good idea for emergencies, don't expect to use a credit card as your primary source of funds for eating and shopping. A majority of small shops, bars, and restaurants in Southeast Asia don't accept credit cards, and the ones that do will often tack on a surcharge or commission of 10% or higher. Your bank will probably also charge a foreign transaction fee unless you have a card marketed to travelers. Credit cards are best used in upscale eateries and hotels, to pay for activities such as scuba diving, and to book cheap flights in Asia. The less you use your card, the less chance that you're number will become compromised -- a growing problem in Asia. Credit cards may be used in ATMs to get emergency cash advances, although you will pay a foreign transaction fee and interest rates on cash advances are usually higher. Visa and MasterCard are more widely accepted throughout Asia than other cards. American Express traveler's cheques can be exchanged in banks throughout Asia for a fee. Carrying traveler's cheques is an old safeguard against carrying too much cash at one time, however, they are becoming less and less popular. A commission is often added per cheque exchanged, so carrying larger denomination cheques will result in fewer fees. Traveler's cheques should just be used as an emergency method to exchange for local currency; hotels and merchants will rarely accept them directly. Before leaving home, record your traveler's cheque serial numbers in a hidden email along with the international number to report lost or stolen cheques. No matter the economy, the U.S. dollar still works best as travel currency in most parts of the world. Dollars can be exchanged or used in a pinch more readily than other currencies. In some countries -- Cambodia, Laos, Vietnam, Myanmar, and Nepal, to name a few -- dollars are sometimes even preferred over the local currency. To counter this, Asian governments have begun placing new restrictions that encourage the use of local currency over U.S. dollars. Even immigration counters often prefer to receive dollars for visa fees when travelers enter the country. Pay in whatever currency works out best in your favor. Carrying a large amount of cash is a bad idea, but having U.S. dollars on hand in a variety of denominations will definitely come in handy. Make sure to carry crisp, new notes as money changers will often refuse old, worn-out bills. If a price is given in dollars rather than the local currency, you are trusting the exchange rate of the merchant -- ask the cost in both currencies. A common scam in Vietnam is to quote a price in dong, then claim that the price was actually in dollars when you are asked to pay! Read more about using money in Vietnam.